They said I must die. They said that I stole the breath from men, and now they must steal mine. In 1828 Agnes Magnusdottir was charged with the murder of two men in Illugastadir, part of northern Iceland. Awaiting execution, the District Commissioner sends Agnes to a remote farm to live with the family of Jon Jonsson. The family is anything but happy to be housing a convicted murderer, but as her execution nears and Agnes slowly begins telling her side of the story to the priest she has chosen to be her confessor, the family realizes that perhaps Agnes isn't the monster they initially believed her to be. As the months go by and Agnes's death looms, Jon's wife and daughters wonder if there's anything they can do to save her before it's too late. 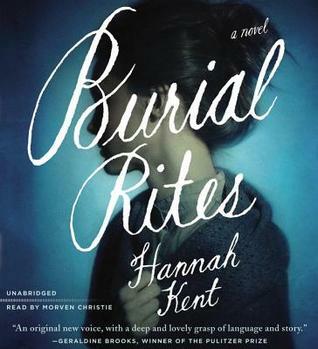 Burial Rites is Hannah Kent's debut novel, but she writes like a seasoned author. Her prose is dripping with vivid, haunting descriptions but not to the point where it seems overindulgent. Kent weaves seamlessly in and out of third person and first person narration, with the condemned prisoner of Anges taking on a first person narrative. Agnes Magnusdottir was a real person convicted of murder and put to death in Iceland. She was in fact, the last person to be put to death there. Kent had a long fascination with Agnes Magnusdottir ever since she traveled to Iceland on a Rotary Exchange as a teenager. The author's note at the end of the book along with her acknowledgements show the vast depth of research she did to write this novel, but in reading the author's note, you get a sense that Kent's research began as something she was interested in learning and grew into an idea for a novel much later. Kent's use of language throughout the novel is both stark and poetic. I don't know if I would have enjoyed reading about Agnes Magnusdottir coming from any other writer. From the first few pages, you immediately get a sense that Kent was meant to tell this story. It's not often that I read adult fiction anymore, finding YA and middle grade much more satisfying, but I was intrigued by the stark setting of 1800s Iceland. Having just returned from a trip to Iceland back in June and knowing what a bleak history the country has, I was curious to read a historical novel set there. Burial Rites did not disappoint. It is easily one of my favorite books of 2013. That is also in part because of the brilliant audio narration by Morven Christie. Her voice was like being cloaked in silk. She was both soothing and austere at the same time. While I initially began my journey with this book from the print galley I received ALA back in June, I soon decided that while I was enjoying reading with my eyes, reading with my ears might help me finish the book sooner. I'm glad I did because reading the book on my own didn't give me the same satisfaction as listening to the audio did. Christie's voice transported me to 1800s Iceland better than I think I could have done from just reading the words on the page. I would highly recommend Burial Rites to anyone who loves historical fiction. However, don't let an aversion to the genre prevent you from picking this book up. Just like Between Shades of Gray by Ruta Sepetys, I think this book transcends genre preferences. Even readers who don't like historical fiction can find themselves swept away by the narrative Kent has created.